Welcome to the new web home for Pulaski Conservation District, located in the heart of central Arkansas! Our site is meant to serve the hard-working landowners, farmers, residents, teachers and students of Pulaski County - encouraging, educating, and assisting them with the goal of making conservation a part of their daily lives. The Pulaski Conservation District was organized to serve Pulaski County by recognizing the needs and objectives of each community and assisting them to meet those objectives. The District provides valuable assistance in this process by coordinating the services and efforts of various state and federal agencies. The District develops and carries out programs for the conservation of our soil, water, and other natural resources within the county. Pulaski County is shared by all of its people, urban and rural alike; therefore we share the responsibility of keeping it productive. ​It’s time for Pulaski Conservation District’s annual pecan sale, with pecans from South Georgia Pecan Co.! Pre-orders are now available for pick-up at the Pulaski Conservation District office in North Little Rock. We also have extra bags of Fancy Large Pecan Pieces available for purchase on a first-come/first-serve basis. PCD accepts payments by check or cash (sorry, we cannot accept credit/debit cards). Please direct questions to Katrina King at our office. Thank you for supporting Pulaski Conservation District and local conservation programs! ﻿New District Annual Report Available! Pulaski Conservation District's 2016 Annual Report is now available detailing our work for calendar year 2016. To download a PDF (Adobe) version of the report, go to the "About" page and click on the green button. 2016 Plat Books Now Available! Our new 2016 Pulaski County plat books have arrived and are available for purchase at the District's office for $50 each. 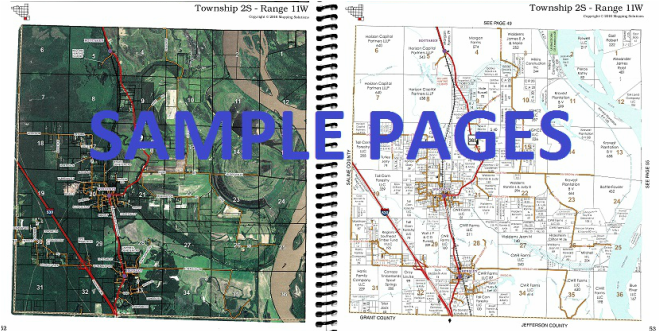 The new plat books include street maps with an aerial photo overlay to help you identify landmarks easily, a landowner index, and a list of helpful websites. Below is a sample of what the side-by-side pages look like for each range. County wall maps are also available for $75 each. Plat books and wall maps can be purchased Monday - Friday, 9 AM - 2 PM. Accepted payment forms are cash or check (sorry, no credit cards). Please contact Katrina King with any questions regarding plat book products. Pulaski Conservation District is a collaborating partner in the Bayou Meto - Lower Watershed RCPP Project, a voluntary program that provides financial and technical assistance to agricultural producers for addressing water quality concerns in the Upper Crooked Creek, Steel Bridge Church-Bayou Meto, Bayou Ink-Bayou Meto, Snow Brake-Upper Indian Bayou, and Hall Creek-Bayou Meto watersheds in portions of Arkansas, Jefferson, Lonoke, Prairie and Pulaski counties. Funding will be available to eligible landowners through EQIP, ACEP, & CSP. NRCS will provide financial assistance for a systems approach using approved conservation practices for the purpose of addressing resource concerns. Land and producer eligibility, adjusted gross income, and all other program criteria for participation must be met to participate in this initiative. Agricultural lands are eligible for enrollment in this initiative. EQIP sign-ups were held in June 2015, with ACEP & CSP sign-ups to be held in 2016. Click on the button below to download a project fact sheet, and watch our website for more information as it becomes available. Due to the holidays, the next regularly scheduled meeting of Pulaski Conservation District's Board of Directors will be held Tuesday, January 16, 2018 at 3:30 PM in our North Little Rock office. Board meetings are regularly scheduled for the third Tuesday of each month and open to the public. We use our Facebook page to quickly post news from across the conservation partnership. Press releases, announcements, workshop info and more can all be found at www.facebook.comPUCD12 Click to stay up to date with us and our partners. PCD's regularly scheduled beaver bounty day is set for the last Wednesday of each month, 9:30AM - Noon. Other days/times available by appointment. See the "District Programs" page for more information.